Description: The Golf Stance Thoracic Rotation is a fantastic pre game warmup exercise. It works to teach proper hip stabilization while also working on trunk rotation and range of motion. All of these combined greatly benefit your pivot and coil in your golf swing on both the backswing and the downswing. Start off by standing in your golf stance with a golf club across your chest. 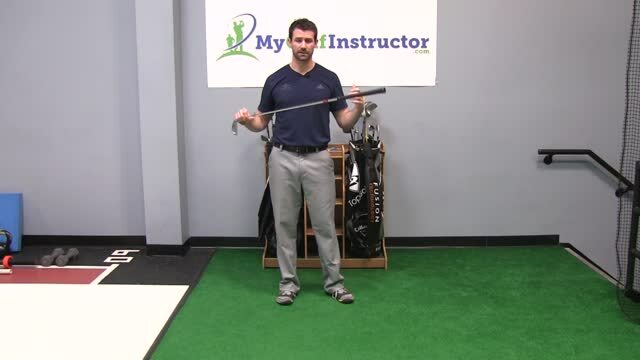 Cross your arms over the club to hold it against your body. Keeping your hips still rotate your shoulders back and hold for a second and then rotate them forward and hold for a second. It is important to remain in your golf posture throughout the exercise and not let yourself lift up. Perform 3 sets of 8-10 repetitions on each side. As you progress and get stronger week to week you can add repetitions.